Khanyi Makwala had been amazing to work with. No task was too small and no challenge was too big. She obviously loved her role and exuded confidence in all she did. From the moment I arrived at the GIBS Business School in Johannesburg on a chilly July morning, Khanyi had everything planned out and prepared with a deft and careful touch. We had asked to move from the large and modern lecture theatre, to a less formal room with round tables, enabling our attendees from Bidvest to better work together on the exercises and workshops that we had crafted. This was managed seamlessly and without any fuss at all. All was in order well ahead of schedule as we awaited their arrival. Khanyi had a story to tell that I wanted to hear. She had worked at GIBS for some 7 years, but not always as the programme coordinator. In fact, her initial two years at GIBS was spent working as a cleaner for the outsourcing company that employed her. She loved the buzz that this great centre of learning and the students generated. She wanted the chance to do more, so much more, but without qualifications and any relevant experience, this seemed to be just another dream. A vacancy arose for a desk receptionist, and Khanyi plucked up the courage to apply for the job. She was not at first successful, but she had been considered and despite not getting the job, her confidence had grown. She applied again when the next vacancy arose. She was accepted and she would never look back. Her strong work ethic and positive demeanour was soon being noticed and remarked upon. A role with more responsibility was her target. A promotion brought her much closer to the custom executive education programmes that she was so curious about. One of the professors encouraged her to apply for the role of project coordinator, and she had all that was required. She now had the job of her dreams. For many women trying to build a career it is tough to stay positive when things are not going to plan or not moving fast enough. It’s always worth just remembering the journey you have been on to get to this still difficult place. You may just realise that it’s been a hell of a journey, with bumps along the way of course, but you may have come a very long way from the relative dark days when you commenced this challenging initiative. This knowledge might just raise your spirits for another push, because things ARE moving in the right direction. Despite the fact that 57 percent of college graduates in the USA are now female, fewer women than men are hired at the entry level according to McKinsey. That narrows the female talent pipeline from the off. Just as worrying, if they do get hired, their chances of promotion are limited. 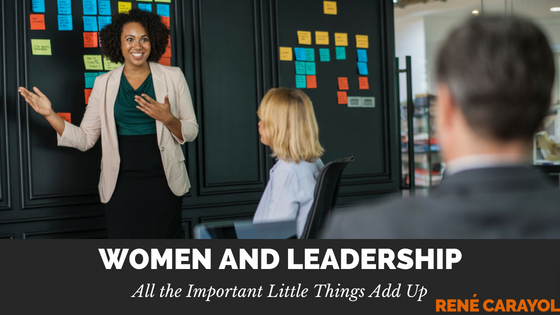 A 2018 Accenture report found women are 22 percent less likely to reach manager level than their male peers regardless of their qualifications; and only about 1 in 5 senior leaders are women. This is of course deplorable and further fuels the fight against such inequality. Whilst doing my research for this article, I came across a really interesting and instructive article by the challenging and intelligent writer on all facets of contemporary leadership, Shellie Karabell, in Forbes magazine (19th May 2016). It was so thought provoking, hard-hitting and from today’s perspective, controversial, and perhaps already somewhat dated just two years later, it deserved a response. The catalyst for her article was the seminal 1977 book, The Managerial Woman: The Survival Manual for Women in Business, which went on to become a best-seller, by Margaret Hennig and her Harvard classmate, Anne Jardim – who went on to speak and give training courses to women in management. “In an effort to clarify some of the thinking of professional women of my generation, and to hand down the benefits of our experiences, I – with input from other professional women – compiled the following list of Ten Commandments for Women leaders”. On reading her Ten Commandments they already seemed really dated and of another era, or is it more that things have perhaps moved on quite a bit? It’s not helpful to be critical of the past, as without the commitment, hard work and strength of those who came before there may not be any platform at all to build upon. But it does help paint a vivid picture of the context of the times, and it’s not that long ago at all. Maybe today the onus is balanced between both women and the prevailing working environments and cultures. Where women have the choice, they must become far more discerning about the environment they choose to offer their skills to and decide to work in. Ensure the values of the organisation match yours – it will be too late to notice a mis-match after you have joined. 3 Prioritize. You may be able to “have it all,” but not have all of it going well simultaneously always. When you juggle work, family, social demands, etc., you actually spread the risk: when one thing goes badly wrong there’s another corner in which to hide. But to make yourself crazy trying to do everything perfectly all the time is, well … crazy. And impossible. 4 Choose your battles. This is another form of prioritizing. Choose those which will create the best for the company, for the family, for you. Err on the side of NOT sailing into battle. You run the risk of becoming a banshee. 5 Speak up. Recent research by INSEAD business school professor Horacio Falcao shows that one of the reasons women are lagging in the salary sweepstakes is their failure to negotiate. This may be a component of women’s belief that working hard will get them somewhere – that efforts will be recognized by those who are in charge. This is simply not the case. Those in charge have other things on their minds. If there’s something you want, ask for it. It’s not impolite; this isn’t a tea party. Don’t be afraid that the boss won’t like you. There has been much rightful anger and indignation about the gender pay gap. The UK Government has forced more than 10,000 large firms to reveal details of their gender pay gaps. Some of the pay disparities are more than alarming. All women in the workforce must know what their real worth is and openly talk about it. Earlier this year the UK Government rejected calls for a specific ban after a campaign by temp receptionist, Nicola Thorp, who was sent home by receptionist outsourcing firm Portico, on her first day at PwC after refusing to wear a two to four-inch heels. 7 Use silence. Not to be confused as the antithesis of “speaking up.” Women talk more than men; they ramble, they forget the cut-off valve between mind and mouth. I have no statistics to support this – only memories of business meeting presentations made by women that went on far too long and ended badly. Silence is a useful punctuation on either side of a well-thought-out statement. Become known for doing what you say you are going to do. It builds trust and respect with everyone in the team and is the best way to build a rock-solid reputation. Back yourself and don’t be afraid to make a commitment, no matter how daunting the challenge that lays ahead. If you’re bold you might fail, if you’re not bold you will fail. 9 Stay positive. Not crazy Pollyanna-like Cheshire Cat grin happy; comfortable in your skin happy. Even if you’re not. Thinking of things that are going right will help you handle those things that are going wrong. Worry and pessimism only cast a pall over the realm of possibilities that could help. Every team benefits from having those with a positive demeanour around. There is room for the more cautious and careful, but that shouldn’t mean doom and gloom every day. Constant pessimism is never fair or liked. Circumstances change – values don’t. No matter what happens at work, stick to your values all the time – never let anyone convince you otherwise. The value in real terms (i.e. after accounting for inflation) of the prize money won by Wimbledon men’s champion Rod Laver in 1968 was £30,000 – the first-year professional tennis players were allowed to play in the Grand Slam tournaments. The women’s champion, Billie Jean King, won £11,000. Both the men’s and women’s champions in this year’s tournament took home £2.25m. · Make Things Equal but Not the Same – Sometimes managers think that they have to treat everyone in an identical manner. When Jane asks for a more flexible schedule, don’t deny it because John doesn’t have one. · Re-evaluate job specifications for the senior management team in the case of companies not hiring women for senior level roles, they should identify what barriers they have constructed which has led to fewer job applications from women. · Consider the culture, polices, and practices currently in existence in your business. It will not take another 45 years, as things change for the better, so many women get stronger and are now forcing change, not just asking for it. Many men feel compelled to also fight for what is right. Together, they are an unstoppable force for good. Britons at long last give up traditional gender roles. A new survey by the National Centre for Social Research suggests Britons have abandoned traditional views on gender roles. Almost three-quarters of the public no longer believe that women should be home-makers while men earn money. As recently as 1988, a majority still said women should stay at home while men went out.